In response to demand from commercial and industrial customers, we offer a variety of sustainable waste management solutions, including secure destruction and energy recovery, onsite industrial cleaning services, wastewater treatment, transportation and logistics, recycling, depackaging and controlled drug substance waste management. We encourage our clients to consider the waste hierarchy in selecting the most environmentally beneficial waste disposal options. Many of these services are delivered through our network of Material Processing Facilities (MPFs), which are specially designed to process nonhazardous solid and liquid wastes. We can receive these wastes either through our own transportation and logistics capabilities or through third parties. Our MPFs can shred, solidify and bulk package various waste types for more efficient transport and subsequent processing and provide wastewater treatment capabilities. Our specially designed UnWrapp system, currently installed at our Milwaukee MPF, provides a recycling option for consumer-packaged goods that may be expired, off-specification or otherwise unusable. The product may be composted, recycled or treated for discharge to the local wastewater treatment plant, and in most cases, the packaging can be recycled. We process more than 140 million gallons of industrial wastewater annually, offering a better alternative to solidification for landfilling or deep well injection. Through screening, pH adjustment, oil-water separation and flocculation and sedimentation, we safely recycle wastewater back into productive use through publicly owned treatment plants. Our in-house lab capabilities ensure proper treatment and compliance with our permits. When pretreatment or discharge into a publicly owned treatment plant is not an option, we can inject certain wastewater directly into the furnace at eight of our EfW facilities. This option allows for the complete destruction of contaminants, making it particularly well-suited for wastewater with high biological oxygen demand that may overload treatment plants. This option is also suitable for wastewater with high levels of persistent organic pollutants, such as pharmaceuticals, that typically pass through conventional treatment plants. Some ammonia-containing wastes have allowed us to reduce reagent use in the boiler for nitrogen oxide control. Certain wastewater may be usable as a direct replacement for potable water at our energy recovery facilities, in our air pollution control equipment or for other uses. Depending on their composition, these wastewaters may be mutually beneficial, offering a reuse solution for the generator and providing some properties that are useful in our process. We offer safe and secure management of waste from pharmaceutical manufacturing and through our Rx4Safety Program, a disposal program for community-led and organized drug-take-back events. Our Drug Enforcement Administration-licensed facilities in Pennsylvania and Arizona, as well as a new facility under construction in Indiana, provide national capabilities for reverse distribution and drug-take-back programs. In addition, two Covanta facilities are permitted to receive untreated medical waste and 20 others can receive treated medical waste, providing local energy recovery options to traditional medical waste incineration. We provide a full range of consulting services to clients who are seeking better methods for addressing their waste management needs. Through our network of facilities, partners and broker arrangements, we translate waste-consulting plans and advice into implemented waste management services. We help companies consider the waste hierarchy and find ways to reduce, reuse and recycle their materials in accordance with zero-waste-to-landfill, GHG-reduction and other goals. We provide full-service environmental health and safety (EH&S) consulting including air, water and solid waste permitting; pollution prevention planning; compliance auditing and assistance; training; site investigation and remediation (Phase 1 and Phase 2 audits); and workplace exposure assessment and monitoring. Our services include cleaning (facilities, site/equipment, e.g., railcars or tankers), demolition and remediation, transportation (hauling solutions) and technical- and chemical-consulting services. Our Industrial Field Services and Waste and EH&S Consulting teams work collaboratively to provide turnkey solutions as needed. We strive to continually improve and expand our services and operations for both existing and new municipal partners. For example, through our bundled services program, which we currently offer in New England, we provide municipalities with a single relationship to address their nonhazardous materials management requirements. With one contract, we can cover single-stream recycling, electronicwaste, organics and energy recovery services. In addition to food and consumer product waste streams, Covanta’s UnWrapp system provides solutions to the health care industry. 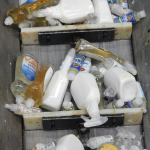 For example, unused and expired saline bags are shipped to Covanta’s UnWrapp system in Milwaukee. The plastic bags and cardboard boxes are separated for recycling, and the saline solution is treated at our in-house wastewater treatment plant, prior to discharge to the local municipality for further treatment.